I'm interested in Phoenix history, and I like to get the help of experts. Luckily, there are a LOT of them out there. And I don't mean Professors at schools, or tour guides, or people like that (although they're fine). I mean people who have lived in Phoenix, people who recognize the difference between Camelback Mountain and the Papago Buttes, without really going to too much effort. People who have seen these places, know these places, and more importantly, love these places. I stumbled into this when I started posting old photos of Phoenix many years ago on a Social Media network that I was learning about called Google+. It was a much smaller, and thoughtful, group than most of the Facebook stuff I'd seen. I use Facebook, but I never saw it as being anything other than places to see pictures of cats (which I like) or "cringe-worthy" comments like "that's what she said!". So I stayed with Google+ until last December, when I noticed that the Google+ Social Media site had become a ghost town, and that while there were a lot of followers of my Phoenix page, I could tell that it wasn't getting a lot of views. So asked for suggestions, and creating a group on Facebook was suggested to me. I went kicking and screaming. I didn't want "Facebook comments" - I didn't want flame wars, I didn't want drama. I wanted to learn more about Phoenix, and to my surprise, I've found it on Facebook. As of this writing, the Phoenix page on Facebook has been there for four months. My Phoenix Historical Images page on Facebook is limited to allow only Admins (that's me) to post, but anyone can comment. And while I've seen a bit of spam, and some comments that look as if they may have been posted while "tipping a few", I've been impressed by the information that has been shared. It could be as simple as someone correcting my sense of direction (I always like to know as precisely as possible where and when a photo was taken, and what direction the photographer was looking). I enjoy this immensely. I'm not selling anything, and I'm not trying to lecture. I'm sharing. The images that I post on the Phoenix page are my "raw information", and once I feel pretty comfortable with them, I try to pull it all together here on this blog. I want to walk in these places, I want to feel what these people felt (well, maybe not the summers before air conditioning was invented!). The people who help me I call PhDs (Phoenix History Detectives) and as far as I can tell, they're as crazy as I am. Mostly they're like me, with no agenda other than hoping to share correct information. They tend to not be satisfied with "back in the day..." or "somewhere near...", and I understand. Vague information, which is usually not researched at all, and is based on something that someone overheard that someone said that someone thought they heard, is useless to people like me, and my PhDs. We don't want to start arguments, we just want to know, and share what we know. If this makes sense to you, I encourage you to speak up. Believe me, I won't be offended if you tell me that Central Avenue and Washington don't intersect (I've written that, by mistake, several times). I appreciate the nasty sarcasm to be kept to a minimum, but I do want you to comment. I update captions and my file names. On the other hand, please don't feel that you have to comment, or anything. 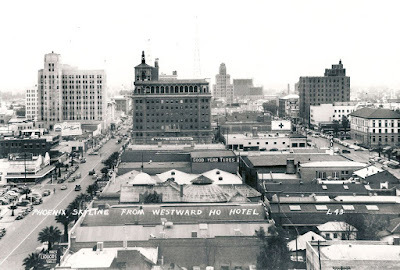 If you just like looking at photos of old Phoenix, please do so. I just love doing that, too. Image at the top of this post: looking south from the Westward Ho at downtown Phoenix in the 1940s.